Two stories have dominated the news coverage in the past few days: Terri Schiavo and the Red Lake Shooting. Both are tragic. While I understand the conflict between Terri's family and her husband which sent them to the courts for resolution, I simply cannot understand a President, a Governor and the congressional majority, all of the same party, grandstanding for sheer political gain at the expense of Terri, her husband and family. While I grieve for all of those caught in this difficult situation , I also grieve for our country which once had laws to protect individual rights in family matters. I fear that Bush is eroding the checks and balances and taking us toward autocracy--or theocracy. Today a friend sent me a copy of this article from the Washington Post discussing Bush's absolute silence regarding the Red Lake Shooting. (I hope the link will continue past today.) Being from Denver Colorado, I distinctly remember the horror, grief and helplessness that pervaded our community during the Columbine Shooting--and the fact that Bill Clinton was on the phone immediately expressing condolences and offering help. I so wish Bush would at least act like a President of the United States instead merely President of the Republicans. I guess grief for residents of a reservation is not "on message" for this week's talking points while rewriting constitutional law for political gain clearly is. This blog is not usually political but today my honest emotions are that I am sad and I am angry. It's my blog and I can grieve and be angry here. "10x10™ ('ten by ten') is an interactive exploration of the words and pictures that define the time. The result is an often moving, sometimes shocking, occasionally frivolous, but always fitting snapshot of our world. Every hour, 10x10 collects the 100 words and pictures that matter most on a global scale, and presents them as a single image, taken to encapsulate that moment in time. Over the course of days, months, and years, 10x10 leaves a trail of these hourly statements which, stitched together side by side, form a continuous patchwork tapestry of human life. Each hour is presented as a picture postcard window, composed of 100 different frames, each of which holds the image of a single moment in time. Clicking on a single frame allows us to peer a bit deeper into the story that lies behind the image. In this way, we can dart in and out of the news, understanding both the individual stories and the ways in which they relate to each other"
Yesterday evening we went to see Mary Lou's Mass, A Jazz Mass for Peace written by Mary Lou Williams. Ligia, our current houseguest and resident ballet dancer and capoerista, gifted us with tickets. What an inspiring and uplifting performance! While I have many differences with organized religion, I grew up with religious music and lyrics and still find peace from listening to them though not necessarily from their literal meanings. As one who has--once again--put myself on a voluntary News Fast in order to maintain some equilibrium in my life, I welcomed the chance to immerse myself in jazz music, dance and a shared commitment to peace. 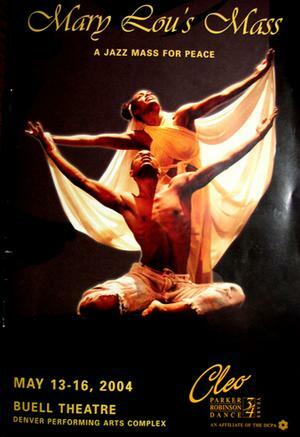 I have attended many performances directed and choreographed by Dr.Cleo Parker Robinson and therefore trusted that this one would be as creative and inpiring as all the others. It was! I so needed to re-connect with the pride of peace-makers in our country. I am weary of feeling embarrassed and saddened at recent actions and inactions of our country's leadership. Last night was a welcomed respite from Iraq and the many other violent conflicts around our world. Winter is here. Photos seem more black-and-white or sepiatone than color. 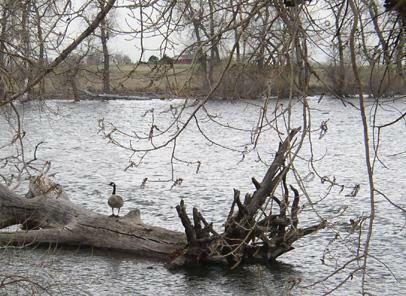 A lone goose anywhere this time of year is a rare sight but this one was protecting its log at Barr Lake State Park. Usually geese are congregated in hundreds at all the parks and open areas. I love geese--if you don't have to clean up after them. They, like Corvids, are "in-your-face" birds. I like that. Today is a count-down day. The gifts are wrapped. Everything is ready for Christmas. I will buy the few perishables tomorrow and pick up the fresh turkey on Wednesday morning to plop it in the brine overnight. My family and dinner guests have been warned that this is my first brined turkey. Bob and I are enjoying the beautiful weather. 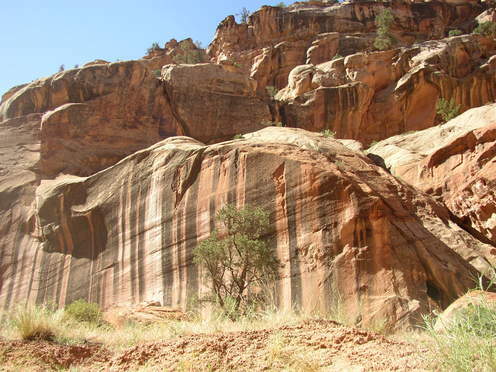 In our free time we've been visiting some favorite places--preferring the outdoors whenever weather permits. The marketing folks tell us Denver has 320 days of sunshine a year. During the winter the sun is on a low slant but even when the air is crisp, the city is bathed in light. We are expected to have 55 degrees (F) on Christmas Day. As a rule, I avoid being political in this blog, but it is above all a chronicle of how I'm seeing my world and at the moment I'm carrying a heavy grief for our country. I am not "connecting" on any level with our governmental policies. Many of my foreign friends write their concern about our leadership and I share their worries and am embarrassed by the aggressive arrogance that the world sees as part of the new direction of the U.S. I bought the last present today. All the names on the list have been checked off. Whew! Now the wrapping begins. Tomorrow I can wrap the ones that I will take to UPS on Monday. Today was totally consumed with small errands: picking up a prescription, ordering the fresh turkey, picking up boxes, ordering flowers for my parents--they absolutely do not want gifts and going to four places before I found the two gifts I needed. I came home so weary that I slept for over an hour. I didn't cook. I ate the rest of my Wolfgang Puck lunch from yesterday. Bob had some left-over chicken and veggies. I did some laundry then made a tentative menu-and-ingredient list for Christmas Day. Bob is in the last 100 pages of Da Vinci Code so I don't expect to see much of him until the book is finished. Now I'm ready to read for a couple of hours. A lot of energy expended but not a lot accomplished! The good news is that Christmas is on its way and I am not at all stressed. Every other Friday my freewrite group meets. I've been attending more or less regularly since introduced to it by my friend Paula in 1998. Today I was able to take my newest daughter-in-law, Jeannene, with me. It was great to spend time with her and to confirm what I had suspected: she is an accomplished writer. My favorite book about freewriting is Writing Down the Bones, Freeing The Writer Within by Natalie Goldberg. The basic principle is to let go of judgement and just go with your first thoughts. I am constantly amazed at where my mind goes if I release any preconceived thoughts. Each time I go I renew my promise to write more at home, to capture those family stories and memoirs that are ricocheting around in my head. Maybe this time I will. 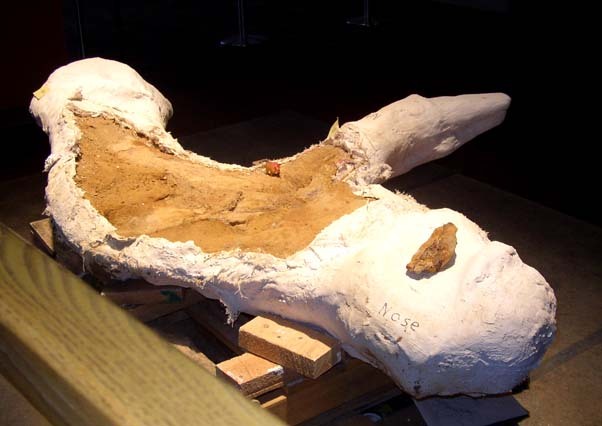 The above photo is of a triceratops in its plaster jacket in the Denver Museum of Nature and Science. It was found three weeks ago, on a construction site 10 miles from my home, by a DMNS volunteer paleontologist. The museum curators are estimating its age at approximately 70 million years. The curved part at the far left of the photo is the frill, the small red pointer is indicating the indentation of the eye and you can see the word "nose" written on the nose. They believe the full skull was intact but the construction machinery sliced it down the middle and the other part crumbled. When they have completed freeing it from dust and debris they feel it will reveal a good profile of the skull. Totally amazing! Today I was standing two feet from bones of an animal whose specie died out 65 million years ago! Today one of my favorite magazines came in the mail: Teaching Tolerance. My husband gets it because he is an "educator" in that he gives educational tours at the DMNS. I was thrilled to see that it is now possible to access Teaching Tolerance online.